The profile from Yahoo! 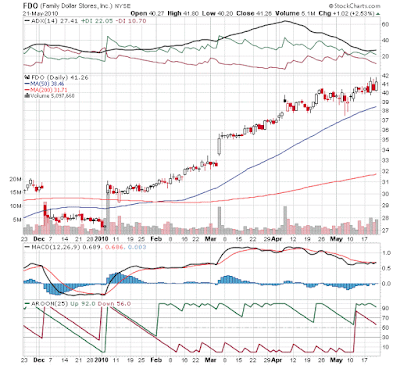 Finance is concise and descriptive enough: "Family Dollar Stores, Inc. operates a chain of self-service retail discount stores for low to lower-middle income consumers in the United States. The company offers consumables, including household chemicals, paper products, candy, snacks and other food, health and beauty aids, hardware and automotive supplies, pet food, and supplies; and home products, which comprise domestics, housewares, giftware, and home decor. It also provides apparel and accessories, including men's and women's clothing, boys' and girls' clothing, infants' clothing, shoes, and fashion accessories; and seasonal and electronics, such as toys, stationery and school supplies, seasonal goods, and personal electronics. As of February 3, 2010, it operated approximately 6,600 stores in 44 states and the District of Columbia." Family Dollar sells most of its merchandise for $10 and less and typically draws shoppers with household incomes of $40,000 or less. The company pays a dividend and, as a matter of act, just increased it. 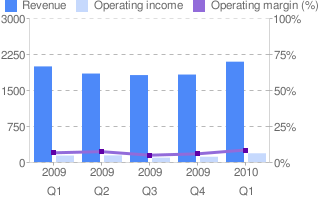 Below we present the chart of Revenue, operating income and operating margin. Not only do we see increases in these financial measures year-over-year but on a quarterly sequential basis, as well. Since this stock is on the Trade-Radar Trend Leaders list, the following chart shows some of the trending indicators that we track: Aroon, DMI and MACD. The trending indicators are all still positive though looking a bit tired. What is amazing, however, is that despite the general stock market dropping roughly 10%, this stock has just continued its march upward. So it hardly seems to be much of a negative to see the trending indicator loose a little a strength given how this stock has outperformed the market over the last few weeks. JP Morgan upgraded Family Dollar to "overweight" from "neutral," saying the discount chain operator's efforts like longer store hours, space reallignment and more advertising are going to help it drive sales in the future. 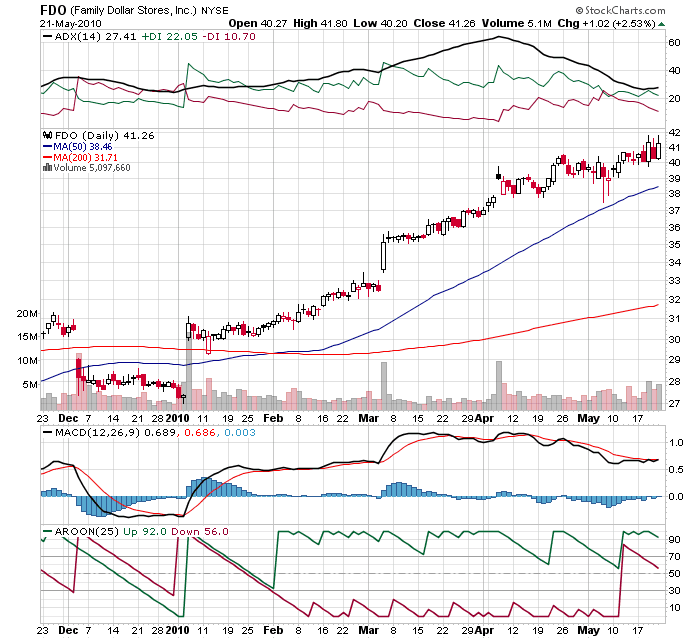 With Walmart struggling to show earnings gains lately, there are those who expected Family Dollar to also show weakness. The opposite seems to be happening. As JP Mortgan says: ""Over the past few months, the 'stickiness' of dollar stores has been above our expectations as shoppers have elevated the importance of convenience to their retail destination decision." As consumers who only discovered Family Dollar during the economic downturn realize that stores like this offer good prices, convenience and even preferred brands, they may have a hard time changing their new found habits of visiting the store even as the economy begins to improve. And given how slowly jobs seem to be coming back, there are plenty of customers who will continue to patronize the stores because a bargain is a bargain and when money is tight, price counts.